Our DESIGNER FRAME SYSTEM is plastic molded sign system with both round and square corners that is designed for quality interior signage and name plates. Several unique features offered by this system will make designing and mounting interior signage simple! Available in both wall mount and desk stand versions. Designer Frame Signs have keyhole mounts or you can use wire pin clips for mounting to fabric covered cubicle partitions. Designer series plastic frames make excellent and attractive desk signs, wall signs, door signs, cubicle signs, and two sided corridor signs. Give your office an attractive executive look with these stylish, customizable and changeable interior signs. laser engraved two colors plastic inserts available in our standard or specialty colors. Designer frames series with rounded corners and Designer II frames with square corners. The Designer series frames are available in five colors: Pewter, Medium Grey, Brown, Almond and Black. The plates can be mounted with Hook & Loop so that they are tamper resistant but still removable with a suction cup. 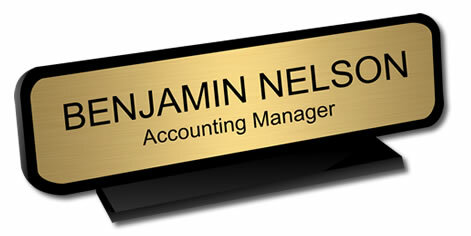 Available desk base snaps into a either a 2″ x 8″ or 2″ x 10″ frame for a handsome desk sign. Wall and Desk frames are inter-changeable so they can be moved or reused as either a desk or wall signs.